Venterra specializes in the identification, finance, acquisition, and management of multi-family residential communities in the southern United States. Venterra currently manages a portfolio of multi-family real estate assets of almost 17,000 apartment units totaling over $1.45 billion in value, generating gross annual income in excess of $180 million. Our organization has completed in excess of $2.2 billion of real estate transactions. Venterra has offices in both Houston and Toronto and employs over 500 people. Venterra’s mission is to acquire and manage multi-family real estate assets that deliver superior cash flow and long term appreciation for our investors while preserving capital. Today we manage apartment communities across the South and Southeastern USA. We are home to over 28,000 residents and 4,000 pets. That’s a big responsibility, and we are committed to doing it with excellence, improving the lives of our residents, by delivering an industry-leading customer experience. We are also committed to providing an employee experience that allows our people to flourish professionally and personally. Our values are both our guide and our conscience in this pursuit. We’ve grown into a company that is paving a new way in the industry, where our employees can make a difference, career growth is available, and where renters are provided an excellent living experience. This is essentially the Venterra Brand. It’s how we see ourselves, and how others see us. At its roots, branding means to indelibly mark something with an identity. Our brand is our identity –it’s who we are. Venterra’s identity is rooted deeply in our seven Core Values which allow a culture of honesty, integrity, respect, and humility to flourish in the never-ending pursuit of excellence. The overall design represents the growth of our company as a whole – our people, our cultural strength, and our expanding footprint of assets and projects. The diamond on top symbolizes the excellence we pursue in all our endeavors. 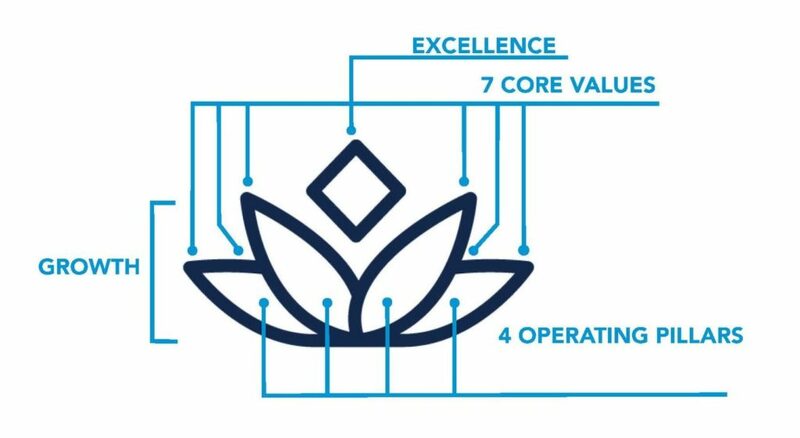 The four leaves represent our 4 operating pillars – Customer Experience, Employee Experience, Operating Excellence, and Technology/Innovation.